Amusement Parks in Hyderabad are filled with thrill and excitement. For family holidays, these parks are great venues for water related activities and amusing games. Ocean Park : Located in Gandipet, near Osman Sagar Lake, 15 kms away from Hyderabad city, Ocean Park amusement park is set up on international standards, is a great place for the family with kids to enjoy a wonderful holiday. The park has two major sections. One section of the park is for water sports and amusement games, and the other section is for kids, with a wading pool and fountain. Helicopters, toy, huge air-filled balloon, and video games for the children to enjoy. Kids can have fun rides like Mushroom Umbrella, Tube Slide, Duck Jets, Floating Bridge, Tilting Bucket, Water Screen, Wide Slide etc. Adults can have fun with roller coaster and the ship ride. Timing: 11 a.m. till 8 p.m. on all days. Entry fee: Rs.150/- for adults and Rs.100/- for kids. Ramoji Filim City - More details here. Lumbini Park : Located adjacent to Hussain Sagar Lake, about 3 km from the heart of the city, this amusement park offers musical fountains, artificial waterfalls, a grand floral clock etc. to make a perfect holiday with family. 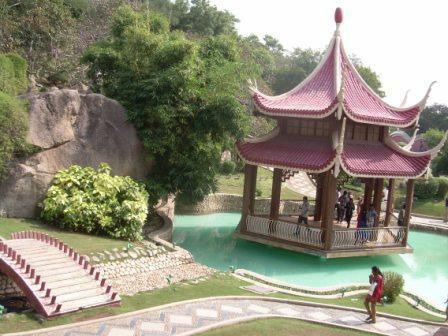 Add Lumbini Park to your list of holidays to visit during Hyderabad visit.